Super fine bow front stick barometer made by Robert B. Bate of London. English stick barometer by Dolland. A wonderful American stick barometer made by D. E. Lent of Rochester, New York. A superb American stick by Wilder of Peterborough New Hampshire. 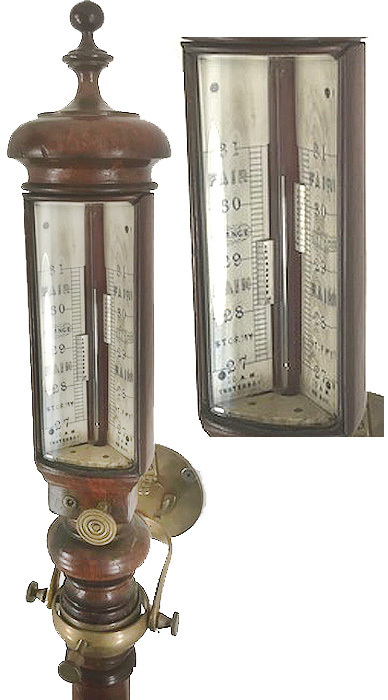 American stick barometer with ripple carving and paper register plates. Made by C. W. Pease of Ontario NY. A cottage barometer by Alexander Adie, Edinburgh. A fine English stick barometer by Peter Hill of Edinburgh. Hill worked from 1801 to 1828. Mahogany stick barometer made by J. W. Queen & Co of Philadelphia. American mahogany stick barometer by Barber, Hartford, CT.
A great English stick barometer by Gilbert and Sons, London. Fine antique English marine barometer by Lawson Melling & Co. of Liverpool. Mahogany with brass gimbal. A fine English oak aneroid barometer. Antique English mahogany marine barometer. A very rare English stick barometer by Battally. Mahogany with satinwood inlay.